Louise has been enjoying a varied role in our practice for the past 4 years thanks to her extra qualifications and skills. Louise is a dental nurse, social media coordinator, photographer, Radiography Lead, and she also sees patients to take x-rays, 3D digital scans, impressions and clinical photographs. At the end of certain treatments, she also takes professional photographs of our patients. A keen photographer with a degree from the Cambridge School of Art, she can often be found taking photographs in her spare time. Louise began her career in the dental field when photographing implant and orthodontic cases for a dentist in Cambridge. Since then Louise qualified as a dental nurse, has extended her role, and has also developed a keen interest in dental hygiene. The favourite part of her job is seeing patient’s transformations; in particular the change from a nervous to a confident patient – and loves being a part of the process. 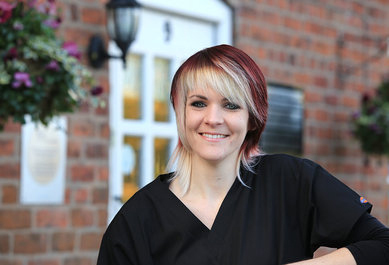 Having moved from London to Cheshire, Louise loves life ‘up North’, and working for Dental Solutions as the practice is so friendly, professional. She is able to use her experience and skills in all the areas of dentistry she has previously nursed for. She often comments that it feels more like being part of a family than just colleagues. Louise is also keen on music, motorcycling, arts and crafts, and loves animals and visiting family & friends (especially if it involves a trip to the zoo or a farm). As a colourful person, she also enjoys dying her hair regularly, and it’s often a surprise what colour it will be from one month to the next, which many of our patients particularly enjoy! Favourite food: Sunday roast with Yorkies, parsnips and lots of gravy. Favourite holiday: Anywhere that is warm and fun.